The application process runs from March 26th to April 29th (12:00 UTC+2). Plan 20 to 30 minutes to fill out the form. Don’t do it at the last minute :) it will be less stressful for you, as well as for the committee. Prepare all your program submissions, as they will be requested in the same form (no submission can be done later). On this page you can check the formats and questions. Read the Friendly Space Policy that will apply to the entire event. Look at the visa information to check if you need a visa to Germany and what actions you need to take. For technical and efficiency reasons, this form has been built with Google Forms. If you can't access Google Forms, or if you don't want to use it, you can answer to the questions per email at info@wikidatacon.org. You'll find the questions in the section below. Here are the questions that will be asked in the form. An asterisk indicates that the question is mandatory. 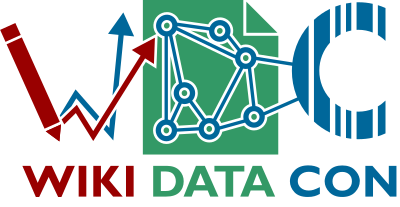 Welcome to the application form for the WikidataCon! This form will ask you information about your identity, background, and other data that we need to prepare the event. It also contains scholarship application and program submission. ⚠️ Please note that filling this form does not mean that you’re registered to the WikidataCon: due to the limited amount of seats, your application will go through a selection process, and you will be informed latest on June 12th of the status of your application. ⏲️ Estimated duration to fill the form: 30min. Following the new rules of the General Data Protection Regulation (GDPR) we are legally obliged to ask for your consent to transmit your personal data to a country outside of the European Union. In this case, we are exchanging certain data with specific employees at the Wikimedia Foundation, based in San Francisco (US), as well as with four community members. These parties are members of the committee that accompanies the program submission and application process for the conference as well as for scholarship applications and therefore require to process the data for these purposes. We will only share the minimum amount of required data that the above mentioned parties need in order to fulfill their roles in the relevant processes. to learn more about how we process and use the data submitted within the event registration form. Declaration of consent*: I hereby consent to my data being transferred to the WMF and the other relevant committee members as described above. More information on how my personal data is processed is available on the web pages listed above. What other related projects are you involved in that make use of Wikidata/Wikibase? How do you see yourself using Wikidata in 10 years? Would you like to volunteer during the event? If yes, for which role would you be ready to commit to? The content you enter in this section will be accessed by the organization team only, for logistic purposes. Have you attended previous international Wikimedia events? If you selected "Yes": Which ones? Please check the following website to find out whether you need a visa for traveling to Germany: http://wmde.org/visa_requirements_overview. Wikimedia Deutschland can offer scholarships to some of the participants. The scholarship covers travel, accommodation, food, public transport inside of Berlin and visa costs. After your application and scholarship request are accepted, we will contact you and book the transport and accommodation. You will be accommodated with another scholar in a hotel room with a double bed (2 single mattresses, no twin beds). If you do not feel comfortable sharing a double bed, please indicate your reasons (especially disability requirements) in the "other information" field at the end of the form. We will try our best to accommodate any special requests. During the main event, the side-events and at all places of the WikidataCon 2019, we will apply the Friendly Space Policy for Wikimedia movement events. This page was last edited on 25 April 2019, at 09:56.